We’ve answered the most common solar system FAQ’s. If you have any further questions, please post them to our Facebook page. What size solar system do I need? First of all, the size of a solar system is dependent on the electricity consumption of a household or business. On average, a 1kW solar system produces 4.4 kWh/day in Western Australia. A 5 kW solar system approximately generates 22 kWh/day and could cover about 80% of the energy usage of a medium sized household. In addition, a grid-connected solar system will reduce your annual power bill regardless of size. Generally, the bigger the solar system, the bigger the savings. So, instead of considering a large solar system, you could choose to install both a solar hot water system and solar panels. Finally, most of your energy can be supplied by a solar power system. Your budget and daily energy usage will determine what size solar power system you need. Enerklean offers free energy assessments to determine the level of solar energy you need to make your desired savings. We can recommend the correct solar system for your needs. How much do solar power systems cost? To determine the cost for a solar energy system, we will need to assess your residence and energy consumption. Enerklean offers cost free energy assessments to determine what size solar power system you require. How much does solar panel installations cost? The price of solar system installation has decreased significantly over the past five years, making it a cost-effective option for homes and businesses. Find out the cost of solar installation with a cost free assessment from Enerklean. Can tenants get a solar system in their rental property? Yes, it’s relatively common for rental property owners to allow their tenants to make improvements to their facilities. As a result, there are many solar power customers who are renting. Is my building suitable for a solar power system? Enerklean can help determine whether your home or office building is suitable for a solar system. Determining factors include orientation, shadows on the available space, amount of roof space and your current electricity bill. Which direction do solar panels need to face in Perth? Technically, the best direction for solar panels to be installed is north facing, and buildings with an unshaded north facing roof are best. However, east/west solar panels could be a good option depending on the installation. Moreover, alternative roof orientation can impact the productivity of the solar power system. Enerklean can assess whether your roof is suitable for solar panels. Does solar power need a new switchboard and/or meter? To install a grid-connected solar power system in your building, a compatible switchboard and bi-directional meter are required. The new meter allows the solar energy produced by your new energy system to interact with the main power grid and the loads in your building. Any energy you sell to the power grid needs to be measured. As a result, a bi-directional meter allows energy use to be measured in both directions (both buy and sell) as opposed to the pre-existing one-way meter. Enerklean is able to help you determine if your meter and switchboard are compatible and we also give price estimates for upgrades if required. Where should the solar inverter be placed? The solar inverter should be placed near the solar modules away from sunshine, rain and dust. Most solar inverters have a display as well as a WiFi solar monitoring system to show the electricity generated by your solar system. Moreover, they feature additional data options that you can access on your mobile phone, tablet and computer. Where can I get financing for a solar power system? The best source of financing is usually the bank. Enerklean is accredited by Macquarie bank to provide financing to customers investing in solar PV systems and energy efficient assets. Our various tailored finance solutions give you the energy assets you require with simple monthly repayments, avoiding large upfront costs. How can I upgrade my solar system? Additional solar panels could be added at any time to increase the capacity of your existing solar power system, but you might have to upgrade to a larger solar inverter. Alternatively, you could choose a larger inverter when initially installing the solar system and add extra solar modules later on. How does a solar system help reduce my carbon emissions? Compare your solar system to a motor vehicle, which is equivalent to 3.3 tonnes of carbon emissions annually. The average car in Australia travels 20,000 km per year. Hence, a 4 kW solar power system can prevent 6.6 tonnes of carbon dioxide being generated, the equivalent of taking two cars off the road each year. Is a solar system safe? The Australian solar power industry is well regulated as all solar panels and inverters sold within Australia must comply with a strict set of safety standards. 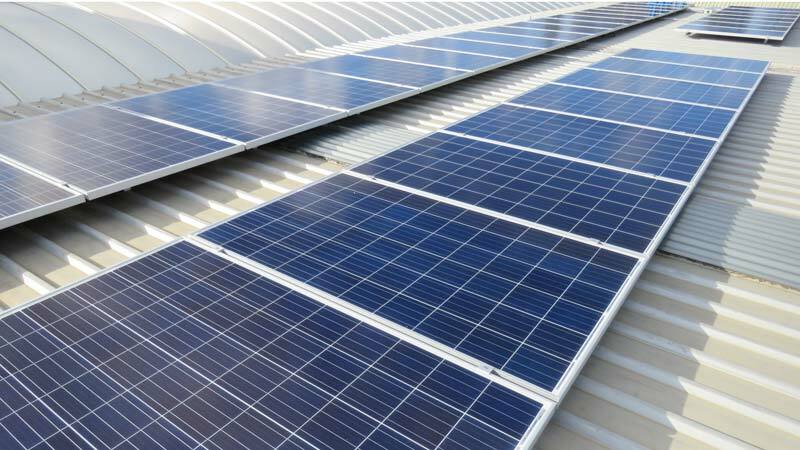 The Clean Energy Council’s Solar Accreditation scheme ensures people who design and install solar systems adhere to the latest safety requirements. Accredited installers are qualified electricians who possess additional qualifications in the installation of solar systems. Solar systems must be installed by a Clean Energy Council accredited installer* to be eligible for small-scale technology certificates (STCs). The CEC maintains a list of currently approved solar panel modules and inverters. *Enerklean only employees accredited solar designer and installer. Photovoltaic (PV) is a semiconductor-based technology used to convert light energy into direct current (DC) electricity without any moving parts, conventional fuel consumption or pollution. As a result, sunlight on PV solar panels produces DC electricity. Consequently, this electricity is converted into alternating current (AC) by an inverter wired into your main switchboard, where it then runs the internal power grid. Generally, there are two types of solar panels – mono-crystalline and poly-crystalline. The two types are very similar except a poly-crystalline panel is slightly larger than the equivalent wattage in mono-crystalline. What is included in a regular solar system? The heart of a grid-connected solar energy system is the solar panels used to absorb the energy of a specific range of available sunlight and convert it into electrical energy. The solar panels are securely mounted on a frame with minimal impact on the waterproofing and structure of the roof. They will be positioned in the correct direction and elevated so that the maximum amount of available sunlight will be received and converted. A cable is installed from the solar panels to the inverter, a device which is designed to efficiently convert the solar energy captured by the panels into predictable and usable energy. Then, a second cable connects the inverter to your building’s switchboard, which connects to the main power grid. This creates a continuous and dynamic system for the contribution of solar energy to your building. Finally, the inverter can also log data using its inbuilt Wi-Fi system. So, it is able to calculate total energy production, daily energy production, and instantaneous power, allowing you to keep a record of your system’s performance. Does a solar power system require maintenance? As solar Photo-voltaic (PV) systems are solid-state technology with no moving parts, they require little maintenance. Therefore, the solar panels will require cleaning to ensure they are able to absorb maximum available sunlight. Additionally, some inverters require the cooling fan outlets to be regularly checked and cleaned when needed. How much roof space is needed for a solar power system? The minimum amount of roof space required to install a 2 kW solar power system including 8 x 250 Watts solar PV panels is approximately 20m2 . How much electricity do I consume? Prior to going ahead with installing a solar photo-voltaic system, it is very important to be aware of your current energy consumption. Enerklean can provide you with a free assessment of your current electricity consumption. How much can I save with solar system? Furthermore, businesses have a couple of other things to take into account, including the tax implications. What is the feed-in tariff (FIT) for a solar system? A feed-in-tariff is the amount your electricity retailer pays you for every unit your solar power system generates that you don’t use at home. Thus, this energy gets fed back into the power grid. Feed-in tariffs are different between states and retailers. Technically, grid-connect solar systems supply solar power through solar panels and inverter. Either directly to the household or to the electricity grid if more energy is provided than the house needs. This is why grid-connect solar systems are often located in built up areas. Therefore, when power is supplied to the mains grid, the home owner usually receives a credit or a payment for that electricity. There is no FIT available for businesses in WA. What is the government rebate for a solar system? In Australia, there are two financial incentives for investing in a solar system and creating solar energy in your own home. The first is feed-in tariffs, a state-by-state scheme where your energy provider is obliged to buy back the energy you export to the grid at a price equal to or above market rates. The second is a small-scale technology certificate, providing a discount on the upfront installation costs for a solar system. What is a Small-scale Technology Certificate (STC)? STCs are government incentives that help reduce the upfront cost of installing your solar PV system. Noticeably, the value of the STC your system receives differs depending on its size, postcode and date of installation. Thus, STCs reduce the full cost of the solar system and provide a generous point of sale discount. Therefore, this scheme has been designed to taper off over time, so the sooner you purchase your system, the better! To be eligible for a STC, your solar system must be installed by a Clean Energy Council accredited installer. Do solar panels work in all weather conditions? Solar panels work most efficiently on a clear, sunny day. However, they still convert energy in different weather conditions. For more info on this subject, check out our blog on common solar power myths. Do I need solar batteries with my solar system? Generally, grid connect systems direct excess electricity produced during the day back into the local electricity grid as there is no on-site storage. So, you then receive credit for any power you put back into the grid. At night time, you automatically use electricity straight from the grid. If you require back-up power or are looking to upgrade your business’s disaster preparation plan, Enerklean can design a solar battery storage solution for your solar system. What is the difference between solar power and solar hot water system? Solar panels take light from the sun and make electricity, and Solar hot water systems take heat from the sun and heat water. What are Flat Panel solar hot water systems? Technically, flat Panel water heating systems are metal plates coated in a dark, heat-absorbent surface with pipes or channels called risers. Hence, the coating absorbs the sun’s rays and the heat is transferred directly to the fluid in the risers. Importantly, the collectors feature a special toughened glass to protect from the extreme heat of the Australian climate. What are Evacuated Tube solar hot water systems? Solar hot water Evacuated Tube Technology is recognised around the world as an efficient method of heating water using the sun’s endless energy. Additionally, solar Evacuated Tubes provide a new level of performance and expectation in the solar water heating industry, with many advantages over other types of solar heaters. Furthermore, Evacuated Tubes technology is super-efficient. They absorb the sun’s energy, trap it like a giant thermos flask, and efficiently transfer heat to the water supply. In addition, they are designed with lightweight, durable and evacuated tube collectors that are ideal for cold weather conditions. Moreover, they can be positioned more favourably towards the sun and collect a greater amount of solar energy for more hours in the day than flat plate collectors. Therefore, the round surface of each tube tracks the sun as it moves across the sky so the face of each tube is always perpendicular to the sun, catching and redirecting the sun’s energy inside. Finally, our solar hot water systems are the optimum choice for cold weather conditions due to the insulation provided by the vacuum between the two layers of glass. This ensures the sun’s energy is not lost, unlike other systems that lose heat in cooler conditions. So, Enerklean only supplies Apricus evacuated tubes products as they are high quality and our solar collectors carry an industry leading 15-year warranty. One kW of photo-voltaic energy can save one tonne of CO2 emissions every year. The first applications of solar power were satellite systems. The Mars buggy explored the red planet – over 200 million km from the sun – using solar power. Bell Laboratories made the first commercial silicon cell in 1954. Albert Einstein’s Nobel Prize was given in part for his work on the photo-voltaic effect. The sunlight hitting the earth’s surface in one hour is enough to supply man’s entire energy needs for a whole year.